“Figure it all out”???? I know I’ve said it, but RORY! HE’S ENGAGED. Rory, I know it’s just a town meeting, but what are you wearing? They are styling Lorelei’s hair up a lot this season. Call back to Lorelei’s First Cotillion episode in season 7? Nah. That would surprise me, since Amy and Dan were gone by then. And would they really go to a town meeting? And wouldn’t Rory all know them from Star Hollow High? Miss Patty not being upfront with Taylor is still wrong. WHO ARE THOSE PEOPLE? There’s TOM!!!! I always liked him. “Give him a crystal sword, he’s a White Walker” I’ve only seen season 1 and was lost the whole time, but I’m guessing this is a Game of Thrones reference. So I have no clue if that’s really funny. But that guy looks beyond sad. This town meeting is a little better than the last one tone-wise. Does the 30-something gang really think Rory is cool? They look so disappointed she won’t join them. Ok, the AC bit is getting old. I really don’t get this gag with the young boys and the southern accents. And calling Rory Khaleesi mixed with this southern stuff really doesn’t make sense. I never needed to see Michel in a swimsuit. Sutton Foster covers a multitude of sins. That woman is amazing. Rory is taking over the Gazette. Shocker. Oh, I love that old guy actor. He has the best voice. That wide shot of Lorelei turning, from the promo? Was done just for the shoes. I love her hair and this whole outfit. No wonder they have her that wide shot. Lauren Graham is stunning. Oh…. sad… I just can’t take that Michel is leaving. The Secret Bar. At least Zach and Lane are playing music here. “I think Frederick ordered one. I’ll have to check.” Ha! The hiding thing from Taylor is kind of cute. Lorelei trying not to cry… What is she, made of stone???? This episode is way too Taylor heavy. I mean, I like him fine. But so far, it’s just a lot of Taylor. Esther will file in that drawer forever. Esther really is no fun. “These Boots Are Made for Walkin’” Best musical cue. This delivery sequence is actually kind of cute. Why did Lorelei dump her bag and papers in the trash and then come back to get them? I hate jokes that aren’t properly explained. The milkshake thing is so real. I knew a millennial obsessed with that movie. He would totally do that milkshake thing with the right group of people to talk him into it. If nothing else, he would do it for the Instagram photo. Rory asked Doyle to contribute a piece to the Stars Hollow Gazette? I mean, I like Doyle, but what is the point of that? “The news never sleeps.” Really, Rory? How often does the Stars Hollow Gazette come out? Once a week? It took me awhile to recognize Christian Borle. I adore him. There are just so many things wrong with this musical. On a repeat viewing, though, I’m finding it absolutely hysterical. Both the lyrics and the choreography of the Love Revolution song are cracking me up right now. The Hamilton bit is still bad, though. Really bad. “Anything by Jeff Cooooooons” I can’t stop laughing. I’m having flashbacks to when I went to Mamma Mia and danced in the isles with the cast. Nat really should put some socks on. That’s never a good look on a man. Carol King is gonna sing. Oh my gosh Carol King is gonna sing. Oh, dear. Her voice. I’m guessing cigarettes have not been her friend. Ugh. This maid thing with Gypsy. IT JUST DOESN’T WORK. I really love the idea that Emily has opened her heart to her staff’s family. 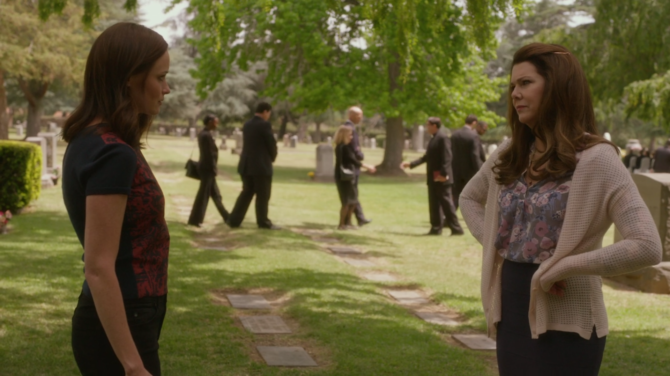 Lorelai has REALLY not dealt with her father’s death. 4 years since she’s seen Jess and no hug?!?!? I really hate that Nora Ephron joke. It’s just tasteless. I’m sorry, but Alexis Bledel is just phoning in this scene, which is a real disservice to Milo. This scene should’ve been so much better. Why must Jess be the only one who can inspire her when she’s stuck? Considering how feminist this show is, I’m bothered by this. Even though I’m Team Jess and am glad to have him in the show, I’m just frustrated with this. Emily not warning Lorelei about this man being there is really, really mean. See, this is why I can’t like Emily. SHE is the one who didn’t warn Lorelei about this guy, so Lorelai struggles to understand it. Then while struggling to understand it, (while externally processing, because let’s face it, we all know that Lorelei is an ENFP) Emily makes all kind of assumptions about what Lorelei really means and turns it around on her so everything is her fault. It’s a painfully passive aggressive donut with cream-filled martyrdom. UGH. And then to be so proud Luke didn’t tell her about their afternoon looking for real estate together! She’s just so awful. Wait. Rory’s old professor is now a headstone salesman? It’s summer in Connecticut. WHY is Lorelei wearing a long-sleeved sweater?!? I admit, Lorelei’s resistance to letting Rory write this book took me a little surprise. I understand her wanting to get keep things a secret from her mom, but does she really think she was that bad of a mother? Or is this lack of differentiation about the Luke secret thing? “For the past 32 years I have been the queen of understanding?” She’s kidding, right? It’s not like Rory has screwed up so much Lorelei has exhausted all her understanding abilities as a friend mom. Rory is not that bad of a daughter. The quitting Yale thing was the worst thing she’d ever done, and Lorelei was not understanding during that (and she shouldn’t have been.) Other than being understanding a few times when Rory screwed up (Missing her graduation and stealing a boat) Lorelei has put the hammer down plenty of times when called for. There just hasn’t been that many instances when she’s need to be understanding with Rory. This fight scene with Luke and Lorelei highlights the best of the show. Lauren and Scott just have a way of back and forth that’s amazing. The whole keeping their lives separate thing makes a lot of sense considering the baggage these two characters have. Not that’s it’s right or healthy, but of course that happened in their relationship. Lane and Rory – I just love these two. I love Lane. FINALLY. An acknowledgment of her own unhealthy behavior in calling Logan when she’s upset. Ha! That Lipitor thing was funny. Logan, you are just so gross. Rory, so are you. And seriously, it’s about time they ended things. HE’S ENGAGED. Lane is a good friend. I would’ve been lecturing her so hard. I just love Sutton Foster’s voice. Seriously, covers a multitude of sins. There is no way this song fits into the Stars Hollow Musical. But it should be in some musical. Because it’s amazing. Seriously, amazing. The song, her voice. And now I’m crying with Lorelai. My theory is the whole reason the Stars Hollow musical idea, which fans mostly hated, was conceived in the writers’ room is so we could have this moment. “I am not unbreakable. I am breaking right now. I need to be unbreakable. Somehow, it’s never or now.” Seriously, this is just such a woman thing. We can all relate. Aw. Luke’s “Why?” when it finally sinks in that Lorelai is serious about leaving is just so heartbreaking. The WILD thing really does makes sense. Cheryl was grieving her mother in the book. Lorelai is grieving her father. Not that she knows that’s why she’s going, but it makes perfect sense in hindsight. Like most of life.